Is building a stronger community and friend group on your resolution list for 2019? Or keeping the connections you have strong? 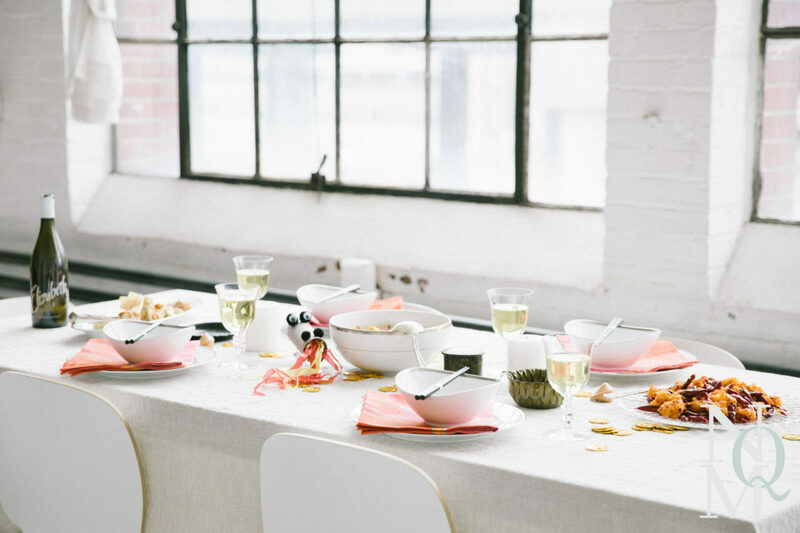 Dinner parties are a fantastic way to do this! And they do not need to be stressful, hard to execute or time-consuming. In fact, they shouldn’t be! So with this in mind, want to host a fantastic, delicious dinner party yet spend only 60 minutes in preparation time? Including cleaning your house? Um…yes, please! How pray tell?!? The Chinese New Year just passed, so this theme would be perfect anytime in the next few weeks and oh so easy to do! 2019 is the year of the pig so there are lots of cute options out there like the awesome black figural bowl or small red dish to give your decor a little nod to this year’s zodiac. Of course Chinese, Thai, or any other Asian cuisine and themes are wonderful anytime of the year so focusing on The Year of the Pig isn’t at all important; any decor that evokes your theme is great. I chose things I already had: an antique black chinoiserie dish and box, a gold dragonfly motif bowl along with pillar candles. There are some pretty paper napkin options, yet I really prefer cloth napkins! I opted for dinner napkins by Beauville and cocktail napkins (that are my absolute favorite) by Wakefield Designs in their monogrammed Chinoiserie pagoda (below). Both are special, heirloom quality so the prices are a bit higher yet because the quality is so outstanding you’ll have them for many years. I’ve had the Chinoiserie Beauville ones for over 15 years! Plus in a classic design like French Chinoiserie, they’ll never go out of style. And if you’d rather opt for a lower price point, check out these floral Chinoiserie as they’re pretty too, as are these black and white toile or blue and white art deco vibe floral napkins. For a kid-friendly party, offer a craft for the kids to do. Just make 1 model, lay out supplies for the dragon blowers linked above and have the kids work on them while the adults enjoy a cocktail. The kids can proudly display them on the table before dinner is served plus have a fun favor to take with them. I used 2 stacked glass votives as a riser stand to draw more attention to my daughter’s dragon, but they’re cute flat on the table too. If you wanted to offer a kids movie after dinner, Mulan or Kung Fu Panda are easy choices in theme. With Asian food—and most take out food in general—you need to be careful to choose dishes that will both taste and look great; opt for dishes with chilis (like the crispy shrimp below) otherwise you’ll end up with a lot of beige and brown dominating your tablescape. When choosing your dishes, remember to balance the menu with an appetizer or two, a soup, a noodle dish, rice, and a main dish or two depending on the size of the crowd. An easy touch to notch up the vibe of the table of a simple table design is to use silver or other unique serving utensils. I’ve collected a variety of silver serving spoons, ladles and tongs at flea markets, antique malls, and eBay for a fraction of the cost of new silver. Dessert can simply be fortune cookies but you could also offer something easy like citrus sorbet, store-bought vanilla petit fours or my daughter’s favorite chocolate-dipped biscuit cookies from Japan. If you’d like to add flowers, opt for something easy like an orchid plant so you can enjoy it long after the party. I’ve seen them at Trader Joe’s, Home Depot, and Costco lately for close to $10. Just be sure to pick a great plant and corresponding free planter (I’ve been known to swap planter pots to get the more classic neutral ones). Bamboo is another interesting choice but any simple arrangement works well. Just keep it simple! Like a bouquet of red or white roses, or a single white hydrangea bloom as shown next to the linen napkin above. Bump up the festivities by using nicer china and crystal rather than everyday dishes and using candles. This set of china is a Macy’s house brand and was very inexpensive even though it looks like higher end brands. I know a lot of folks have china yet rarely use it and I really think everything you have should be used; why store it just to pull out at the holidays?!? I’ll be featuring easy dinner parties regularly. I have the Fried Chicken and Pizza Party options planned for the next few weeks so stay tuned.